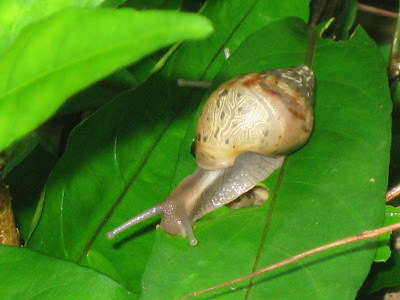 The monsoons are almost over, and since we have spent the last few months searching for and photographing snails, I thought it would be appropriate to write one final, exhaustive post about these creatures which fascinate Samhith. They are indeed fascinating, even though they are the pests here, eating up our garden little by little. They are most visible on the rainy days, and the days after, disappearing once the water dries up, disappearing into holes we have not yet succeeded in discovering. So here’s some of the information we have gathered (from the net of course, where else?). Snails are called ‘Gastropods’, literally meaning ‘belly footed animal’ (Gastro means stomach and pod means foot). 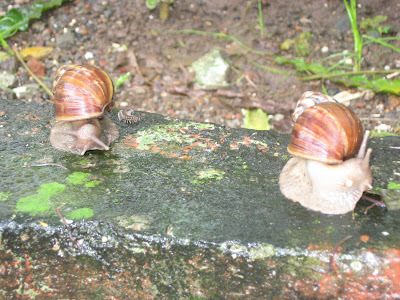 Garden snails are the only molluscs living on land! 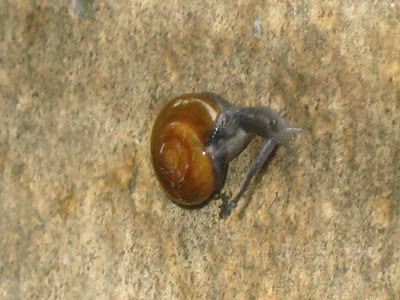 The snails’ body is long, moist and slimy, and the shell helps protect it. It withdraws into the shell not only to protect itself from predators, but also to protect itself from dry weather. They are most active in a moist climate, which is why we see them so often in the monsoons. In dry weather, they simply hide and stay within their shells or in holes in the ground. In winter, they hibernate for months! 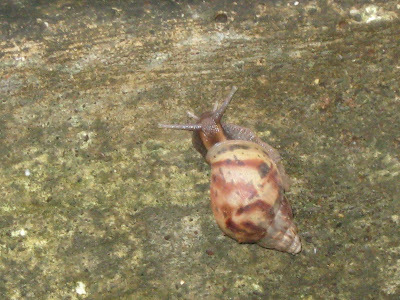 Snails are of different sizes and have different shaped shells. The shells of a juvenile (young one) are lighter in colour and have different patterns. Can you see the difference in shell patterns? Snails live for about 5 to 10 years. The largest snails are the ‘Giant African Snails’, which can grow to a length of over 30 cm! The longest ones I have seen are around 5-6 cm. 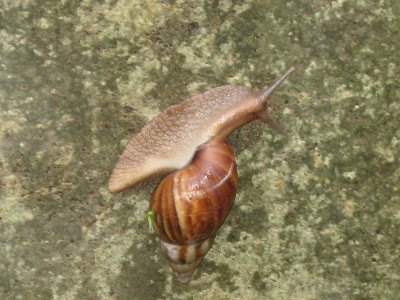 Snails move by creeping on the muscles underneath their body – a foot like structure, which expands and contracts, creating a movement which pushes the snail forward. This ‘foot’ also has a special gland which ejects a slimy substance which helps the snail move easily, even over rough areas. Snails are both male and female – they are called ‘Hermaphrodite’. While mating, they twist around each other and cover themselves in the slimy substance. Look at this one.... We realized that there was something odd about that tail on the shell... it couldn't possibly be the tail of the same snail, but we couldn't go over to the other side of the wall, and thus couldn't see if there was another one there, but on reading about their mating habits, this seemed quite possible... Don't you think so? A snail lays as many as 80 eggs at a time into the topsoil on the ground. They can do this almost 6 times in a single year. No wonder there are so many snails around! Baby snails take almost 2 years to become adults! That was quite a bit of information, wasn’t it? I searched all that so I could explain to Samhith, and it was so interesting that I decided to write about it instead! Hope you all liked it. thats a hell lot of information !! Lovely pictures and now I know something about snails. Thank you. Wow! That's a lot of info packed in one post!!! Will get my son to read this! Thanks for sharing..
WOW! Great pictures and a fantastic post on Snails. Now I do something about Snails or should I say Gastropods :-) thanks to you and Samhith! @slogan Murugun: would love to see yours..
@Arti: we didnt know much either, but having so many pics, i decided to do a bit of research and write it up! @Usha: good.. let me know if they find it useful! @KParthasrathy: i know these are pests, and as I keep telling samhith, we like them just because they are not eating up our useful plants... but they are fascinating, nevertheless! 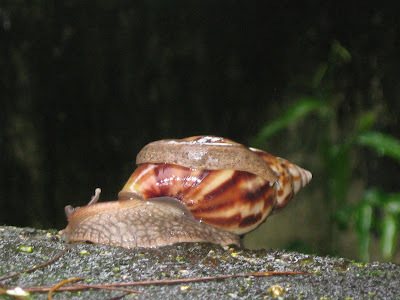 @Sankara: thanks.... its a pleasure to share the info..
nice that you have different species of snails around. we have only one kind but during monsoon hundreds of comes out and we have to be careful that they not get crushed. Yes Sejal, we have two major varieties of snails, apart from others with different markings! some of them are quite huge, so its not difficult to avoid them.. we too are afraid of crushing the smaller ones, though!